Dating very precisely to 1909 because of its mark and registered design number, this teacup trio set, consisting of teacup, saucer and matching tea plate, is by English Staffordshire pottery H M Williamson & Sons, under their Heathcote China label, with registered design number 557909. It is quite simply beautiful. 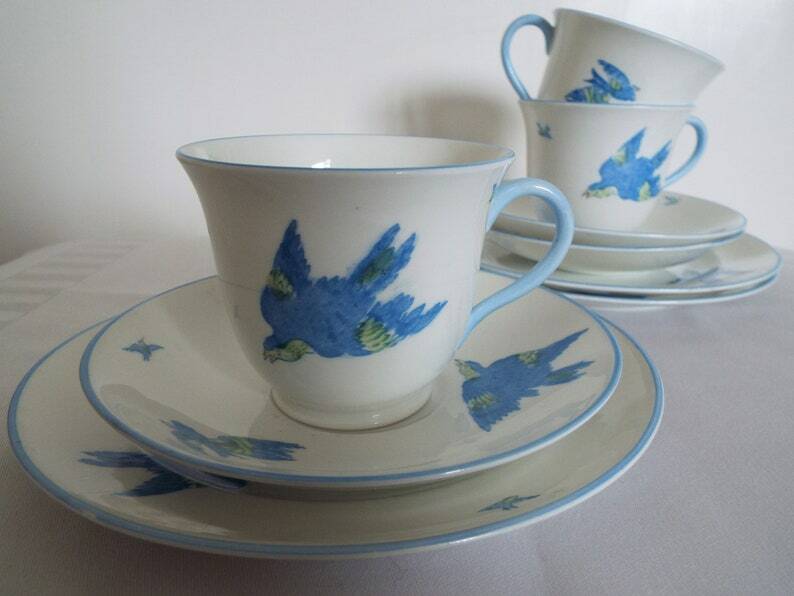 The pretty pattern of bluebirds flying and soaring high in the sky, makes this teacup trio really stand out, whether on the tea table or on display. It is definitely one of the most pretty and unusual teacup trios that I've listed on my shop. The shade of blue for the birds and the rims and handle is especially beautiful. The rims and handle are entirely painted by hand. The bluebirds are transfer printed and then highlighted with hand painting. The decoration continues around the entire teacup and all around the saucer and tea plate, with so many unique and different bluebirds, each soaring in different ways and at different perspectives of distance. I love to turn the teacup around and look at them all. This really is very beautiful antique English Edwardian set from one of the Staffordshire potteries. In very good antique condition, no cracks or crazing to the glaze. There is the odd little tiny fleck in the china in isolated spots, such as the one shown at the bottom of the teacup in photo 8, but this is a natural occurrence of the contemporary manufacturing process at the time and reflects the trio's history. As shown in photo 10, the saucer has one little flake of a chip to its base underneath. This cannot be seen from the upright side and does affect soundness or usability in any way. It is very minor. Any further wear or marks are commensurate with age. Your teacup trio will be prettily gift wrapped for free in vintage style brown paper and ribbon. Please see some of my other listings for examples of my pretty packaging.